Page Updated:- Saturday, 13 April, 2019. Above photo 2010 by Oast House Archives Creative Commons Licence. Above photo 2012 by Nigel Chadwick Creative Commons Licence. Above sign left 2010. Sign right 2013. Maidstone Telegraph, Rochester and Chatham Gazette, Saturday 22nd September 1860. 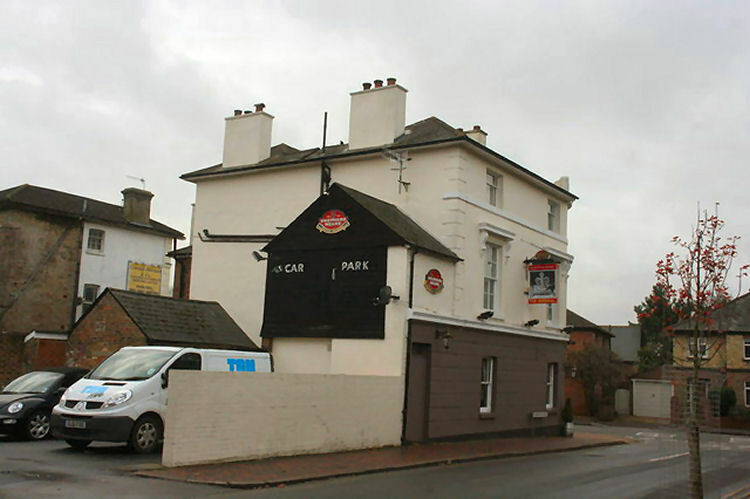 The application of William Waghorn, of the "Imperial" beer-house, Southborough, was informal. From the Maidstone Telegraph, Rochester and Chatham Gazette, 21 September 1861. 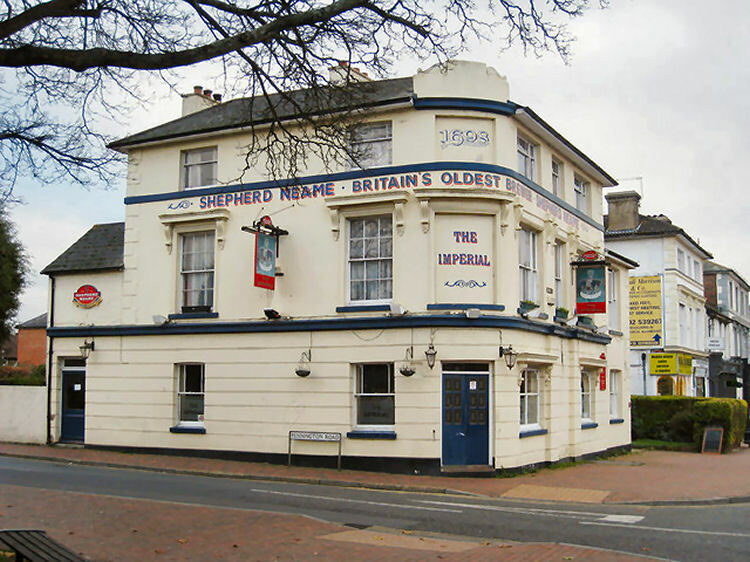 William Waghorn, of the "Imperial" beer house, Southborough, was supported by Mr. Simpson, and Mr. Cripps opposed on behalf of the two licensed victuallers of the place. This was a third application and a licence was granted. From the Maidstone Journal and Kentish Advertiser, 24 September, 1870. The Petty Sessions were held on Tuesday before C. Powell, Esq., (in the Chair), A. Pott, Esq., Major Scones, Sir David Solomons, Bart., M.P. and J. G. Talbot, Esq., M.P. 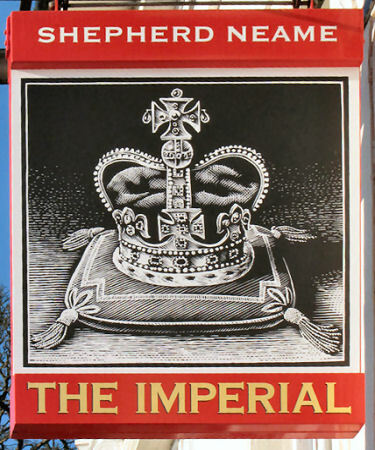 The license of the "Imperial Tavern," Southborough, was renewed to Mr. David Keard (son-in-law of the late Mr. John Apps). The bench granted the certificate. From the Kent and Sussex Courier and Southern Counties Herald. 25 July 1873. On Tuesday last, a Barming fruit van was being conveyed through Southborough, and when near the "Imperial Hotel" one of the wheels came to pieces, and the fruit—raspberries and red currants—was scattered in all directions. Considerable labour was expended in gathering it together, but notwithstanding the vigilant exertions of those in charge, the juveniles, who speedily congregated feasted to their heart's content. From the Kent and Sussex Courier, 5 June 1874. Tonbridge Petty sessions. Transfer Of Licence. 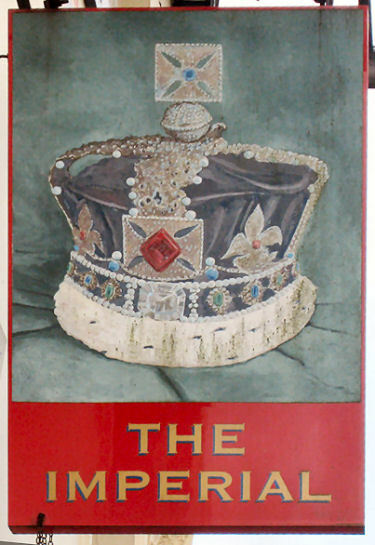 The licence of the "Imperial Hotel," Southborough, was transferred from Mr. Thomas Waller to Mr. Henry C. Gould. From the Kent and Sussex Courier, 1 July 1874. Alleged Case of Refusing to Leave a Public House. James Tuchner and John Tuchner were summoned for being drunk and quarrelsome, and refusing to leave the "Imperial Hotel" when requested to do so by Mr. Gould, the proprietor. The Bench did not consider the evidence strong enough to warrant a conviction, and dismissed the case.